We are delighted to welcome novelist Susanna Calkins to Omnimystery News today. Susanna's debut mystery, A Murder at Rosamund's Gate (Minotaur Books; April 2013 hardcover and ebook formats), introduces 17th-century English chambermaid Lucy Campion. We recently had a chance to talk to Susanna about her new book. Omnimystery News: When you set about writing A Murder at Rosamund's Gate, did you intend for it to feature a recurring character? Susanna Calkins; photo credit Lisa Bagadia. Susanna Calkins: Interesting question! 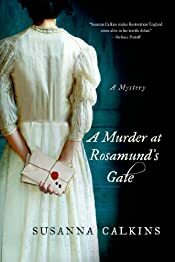 Actually, when I first started writing A Murder at Rosamund's Gate, I didn't really imagine the book as a series, so I wrote it as a stand-alone. However, I really hoped that Lucy Campion, my seventeenth-century London chambermaid, would come to see some of her aspirations fulfilled, which couldn't realistically all happen in one book. I do want Lucy to grow and develop, and move beyond her expected station. In the second book, Lucy is no longer a chambermaid, but has become a printer's apprentice; a rare, but not unheard of, position for a woman at this time. OMN: "Write about what you know", or so it seems we're all told at one point or another. Is that the case here? SC: Ha! That's funny. I never really heard that advice, probably because I only ever took one writing class (in the summer before twelfth grade) and I don't remember much about it. Maybe the instructor gave me that advice, maybe he didn't. I remember coming across that expression later, though, when I starting reading blogs and books about writing. I guess I always took that advice to write about what you know of humanity, as well as what you can know through research and imagination, if not actual personal experience. (After all, we'd have no good historical fiction, science fiction, or fantasy — let alone crime fiction — if people literally "wrote [only] what they know." By the time I started to write Rosamund, I had completed a Ph.D. in British history and lived in London for a while, so I felt I understood something about the time period, the physical layout of the streets, and most importantly, how murders were understood and communicated at this time. I spent a lot of time imagining how an uneducated servant could solve a crime, probably because I always assume if I had lived in 17th-century England this could easily have been me. OMN: You mentioned living in London, the setting for the book. Tell us a bit more about that. SC: My books are set one before the Great Fire of 1666, and the other directly after. The layout of the streets changed dramatically during this time period. I have several wonderful maps that I studied, which lay out the physical configuration of the streets. I also use Mapquest, which now has a feature that indicates walking distances. While this is not perfect, it does give a sense of how long it might have taken my characters to walk from point A to point B, even on unpaved dusty roads. I've tried to be scrupulously accurate, but I have no doubt that I've still made mistakes. My big regret is that I did not add a map to my book to help my readers imagine the layout of plague-ridden 17th-century London. OMN: What was your most challenging topic to research? SC: While I enjoyed researching different aspects of this time period, there were a few things that were really hard to figure out. How fast could a horse travel during this time period? Well, there's a pretty complicated formula for this. How did people of different stations address each other? I tried my best, but I think I still made some mistakes, erring on the side of informality for the sake of readability. These kinds of everyday details were often harder to research than the larger themes concerning gender, politics, religion and law, which were far larger in scope. OMN: What kinds of books did you read as a child? SC: I was a voracious reader when I was a kid, reading everything I could get my hands on. Nancy Drew and Agatha Christie were among my early favorites, as was the historical fiction of Sally Watson and Elizabeth Speare. I also loved the series by Madeline L'Engle (A Wrinkle in Time), Anne of Green Gables, and Lloyd Alexander (The Prydain Chronicles), which all showed a young hero's journey, albeit in very different ways. When I was working in London, I began to read Patricia Cornwell and Anne Perry, the latter leading me to all kinds of other historical mysteries, such as those by Charles Todd, Rhys Bowen and Jacqueline Winspeare. When I started writing Rosamund, I basically wrote the kind of book that I loved and wanted to read. SC: The sequel to Rosamund, currently with my editor, is tentatively called From the Charred Remains. The title alludes to a puzzle — well, okay, a corpse stuffed in a barrel — that Lucy discovers while helping with the great clean-up after the Great Fire of London. I'm also been working on a young adult novel about a gang of teenage thieves planning a heist in late 19th-century Paris. Susanna Calkins is a historian and academic, currently working at Northwestern University. She's had a morbid curiosity about murder in seventeenth-century England ever since she was in grad school, when she was first working on her Ph.D. in history. The ephemera from the archives — tantalizing true accounts of the fantastic and the strange — inspired her historical mysteries, including A Murder at Rosamund's Gate. Born and raised in Philadelphia, she lives outside Chicago now with her husband and two sons. To learn more about the author and her work, please visit her website at SusannaCalkins.com. For Lucy Campion, a seventeenth-century English chambermaid serving in the household of the local magistrate, life is an endless repetition of polishing pewter, emptying chamber pots, and dealing with other household chores until a fellow servant is ruthlessly killed, and someone she loves is wrongly arrested for the crime. In a time where the accused are presumed guilty until proven innocent, lawyers aren't permitted to defend their clients, and — if the plague doesn't kill them first — public executions draw a large crowd of spectators, Lucy knows she may never see this person alive again. Unless, that is, she can identify the true murderer. Determined to do just that, Lucy finds herself venturing out of her expected station and into raucous printers' shops, secretive gypsy camps, the foul streets of London, and even the bowels of Newgate prison on a trail that might lead her straight into the arms of the killer.